I made my first fastalavnsboller yesterday. I translated it into American measurements, and I will list both here. 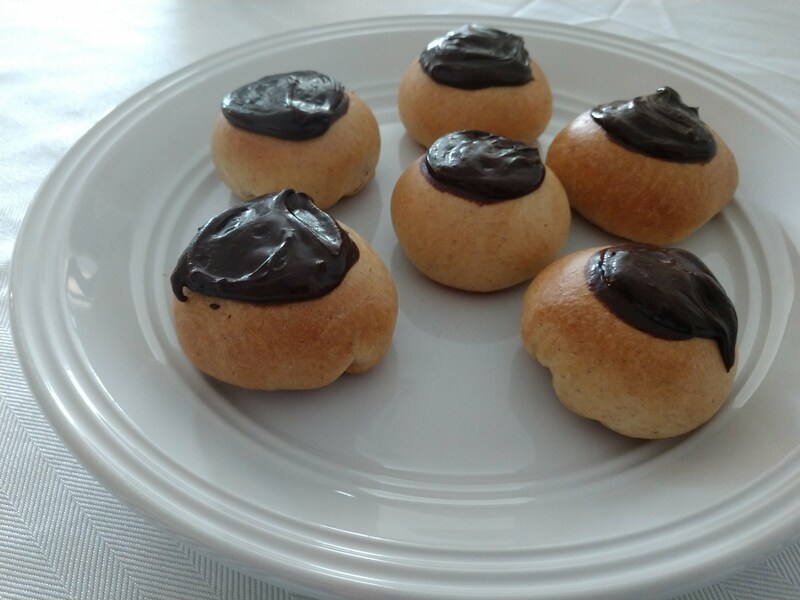 First though, I have to give the recipe for marzipan, for the recipe calls for that, and that is not something you can buy in the US, but it is very easy to make. Pour water and sugar in a pot, and let it simmer for about 5 min. Take the pot of the heat, add the butter. When the butter is meltet add the yeast and stir. Add the 2 eggs and the dry ingredients to the pot. Mix it well before adding the all purpose flour, a little at a time. Knead the dough on the counter for about 5 min. The dough should be soft and not stick to your fingers. Let the dough rise in a bowl covered with a clean kitchen towel for 30-45 minutes. Whisk egg, sugar, cornstarch and vanilla together in a bowl. Warm the milk in a pot till it reaches 140 degrees fahrenheit (60 celsius), and add it to the egg mix while stirring. Mix it together, and pour it back in the pot. Whisk while slowly heating the mixture. As the mixture heats it will thicken. It is supposed to be thick and smooth. So make sure to whisk under the entire heating process. When the creme is thick take it of the heat and add the chopped almonds. Whisk in the butter and cinnamon with an electrical mixer, do it fast, and make sure not to over whisk it. When the dough has finished rising, you roll it out to one big square about 0.2 inches thick (0.5 cm). On each square you put a tbsp of the vanilla creme and the remonce. Fold the corners over the stuffing and make sure to squeeze the dough where the dough is open, if they are not completly closed the stuffing will run out. Put them on a sheet pan covered with parchment paper, make sure the side with the closing is down. Let the fastalavnsboller rise for 30-45 minutes under a clean kitchen towel. When they are finished rising, you brush them with a little milk. Put them in a 350 degrees fahrenheit (175 celcius) oven for 15-30 minutes. When the buns are out of the oven let them cool. While they are cooling you can mix some frosting.